First of all: best wishes for the New Year from everyone here at CoderDojo Belgium HQ! Together, we will turn 2019 into a year filled with coding fun. Coolest Projects Belgium is back! We will host our junior maker fair on 27 April at Technopolis Mechelen and we are dreaming big! Kids can register via www.coolestprojects.be. As always, it’s completely free! Because CoderDojo is really booming in Wallonia, we decided to create an extra Facebook account: CoderDojo Belgium – FR. We wanted to do this to facilitate interaction within our community. In our opinion communication will be easier when everyone is able to speak his/her own language. 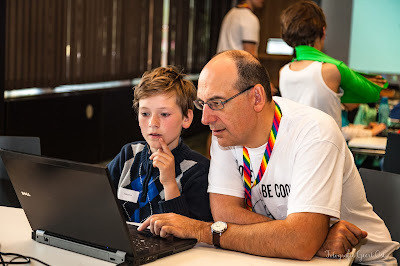 The old CoderDojo Belgium page has been rebranded as CoderDojo Belgium – NL. Feel free to follow both pages if you want to be informed about CoderDojo on the other side of the language border. We will keep on using one page for Twitter, LinkedIn, Instagram and Youtube. The Clinicoders are kicking off a new project. You can read all about the Clinicoders and some other topics in this month’s newsletter.